Zambian Registered Midwife and Advanced Neonatal Nurse Specialist Bupe Mwamba of Lusaka has been awarded a prestigious Midwives for Life award by the Sanofi Espoir Foundation and the International Confederation of Midwives (ICM) for her winning proposal to change umbilical cord clamping practice in Zambia. The Midwives for Life awards fund projects developed and conducted by midwives, and Ms. Mwamba's proposal was selected for a 5000 Euro award. Winners of the awards were announced on May 5, the International Day of the Midwife. 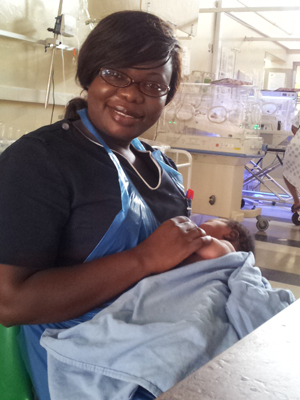 Ms. Mwamba's proposal came from her heartfelt dedication to improving the lives of neonates in Zambia. Her proposal will reach more than 500 midwifery students, instructors, and practicing midwives with a presentation that will inform, dispel myths, and call for a commitment to change umbilical cord clamping practice to improve the health and outcomes of newborn Zambians. Ms. Mwamba is a member of the Midwife Association of Zambia (MAZ) and is a TAZA Midwives (Twinning Association of Zambian and ACNM Midwives) twin. The 2 associations entered into a twinning relationship in 2014. Formed under the umbrella of ICM's twinning project, the alliance was born to create opportunities for capacity building, exchange of best practices, organizational effectiveness, relationship building, networking, and solidarity between ACNM and MAZ. During her studies for her advanced credential beyond her midwifery education, Ms. Mwamba learned of and observed delay or milking of the umbilical cord before clamping. In her home country she is well aware of the high rates of infant anemia and infant morbidity and mortality. She also knows that midwives in Zambia have been taught immediate cord clamping as part of an effort to promote active management of the third stage of labor. She now seeks to help change this practice from immediate to delayed cord clamping. Ms. Mwamba learned of the Midwives for Life Award through the TAZA Facebook page. The TAZA group, consisting of ACNM Division of Global Health midwives Wreatha Carner, CNM, Lauren Arrington, CNM (Education Section), Karen Cullen, CNM, and Meagan Chuey, CNM (Research Section), complemented Ms. Mwamba's work with additional research, drafting, and editing of her proposal submission. MAZ member Hellen Mahamba was also assisted by the team and successfully submitted a proposal which earned an honorable care challenge. To learn more about TAZA Midwives, visit www.midwife.org/TAZA-Midwives.